Chocolate Cherry Macaroons - Yummy Coconut Cookie - 4 WW Points! 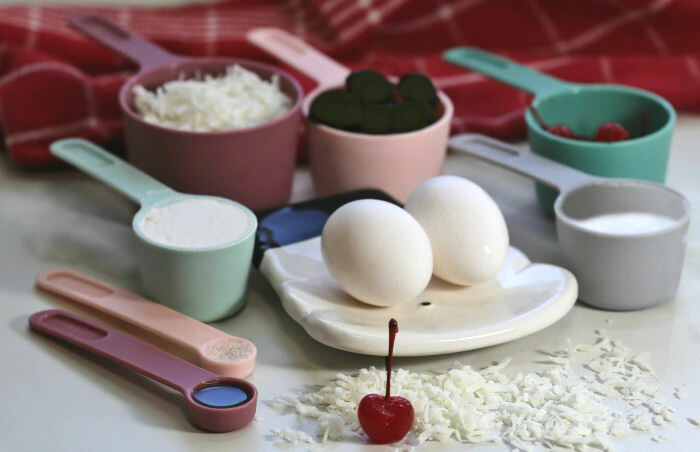 These chocolate cherry macaroons have a light and crunchy coconut and egg white base that is topped with a maraschino cherry and drizzled with rich, dark chocolate. Chocolates and cherries – I can’t think of anything that goes better together. If you love this taste too, be sure to check out my chocolate cherry bundt cake. It has a cheesecake center and tastes amazing. Many of us celebrate the Christmas spirit by making new and yummy cookie recipes. But adding a few new cookies to your day can add to quite a few pounds by the time New Year’s Day rolls around. Instead of serving your family sugar and fat laden sweet treats, try these chocolate cherry macaroons this year. They are light on the waistline but you would never know it from the taste! Coconut macaroons are small cookies that are normally made from either ground almonds or coconut (sometimes even potato!). They are lightly sweetened with sugar and often have a chocolate coating. Many recipes call for sweetened condensed milk. The cookies are baked and very light in texture. Many people confuse this cookie with macarons, but this is a totally different sweet. Macarons are a French dessert that is meringue based made with egg whites, confectioners sugar, ground almonds and food coloring. The name is similar but the taste is quite different, especially when coconut is used in macaroons. 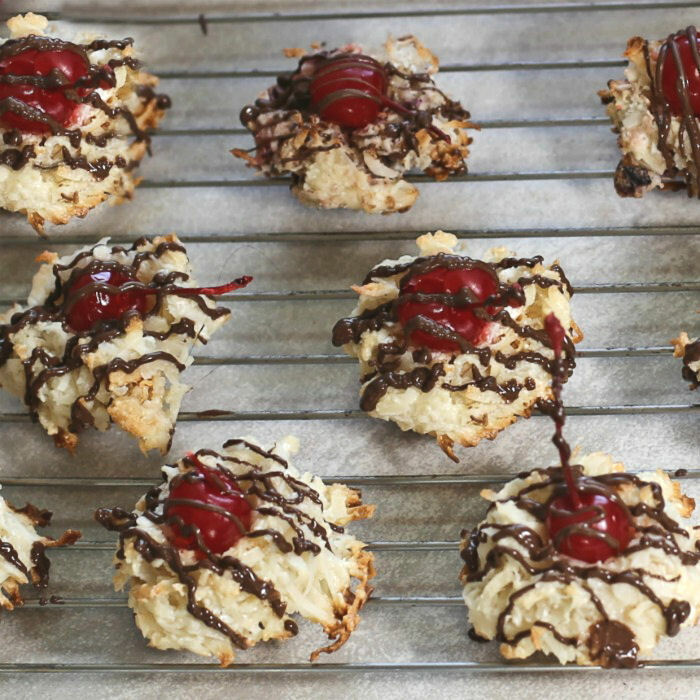 The base of these chocolate cherry macaroons is sweetened coconut. That means that you don’t have to add a much sugar to the recipe. The cookies only have a tiny bit of flour and they have a light drizzle of dark chocolate. The tastes go perfectly together and you end up with a diet friendly sweet treat that you can eat without feeling guilty. The key to the lightness of these coconut cookies is to really whip the egg whites. 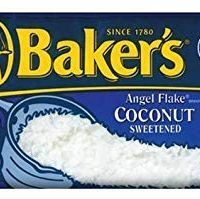 This makes them nice and firm when you add the coconut and flour, which helps to make them hold up well in the oven. I beat mine for 7 minutes until they were firm and quite glossy. The easy coconut macaroons are ready to go into the oven in just about 15 minutes and are super easy to make. Once the egg whites are ready, gently fold in the coconut, flour and vanilla extract. Another 15 minutes in the oven and you are ready to add a festive look to the cookies. You could eat them as they are, but for just a few more calories let’s add some deep, dark chocolate and a cherry. One of my favorite Christmas sweet treats is a chocolate covered cherry and it gave me the inspiration for this recipe. I took the macaroon cookies out of the oven and immediately made a small indentation and added a maraschino cherry. 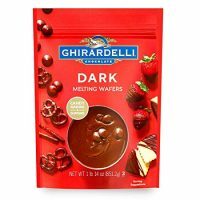 Ghirardelli dark chocolate melts get added to an icing bag and drizzled over the cookies. 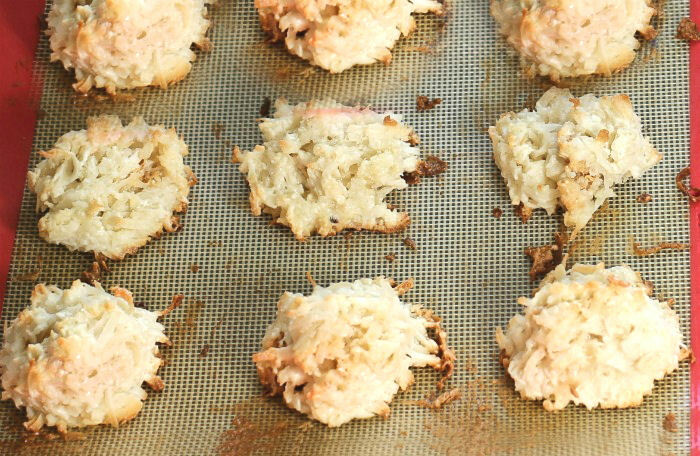 Flaky coconut macaroon cookies that have a light center but decadent outer drizzle. What is not to like? These delicious and easy chocolate cherry macaroons are very light because of the egg whites but have a nice crunch from the coconut flakes. They are lightly sweet without giving you a sugar rush. And that extra drizzled chocolate and maraschino cherry? Totally worth the extra 21 calories!! 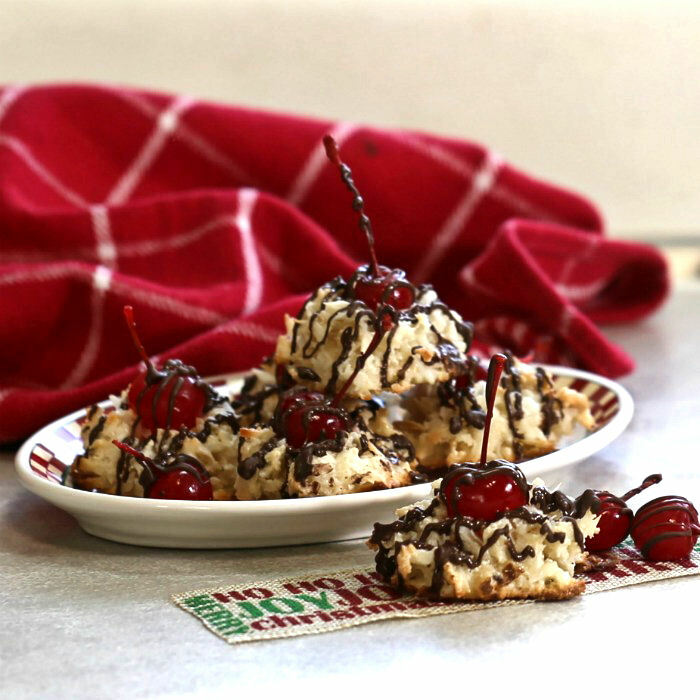 If you like chocolate covered cherries, you will definitely love these cookies. How do I keep the calories and fat so low in these chocolate cherry macaroons? Most sweet treats have a lot of sugar and butter. That is sort of the nature of the beast. And many macaroon recipes also call for sweetened condensed milk with is loaded with both. I used egg whites instead of eggs. Almost all of the calories and fat in an egg comes from the yolk. 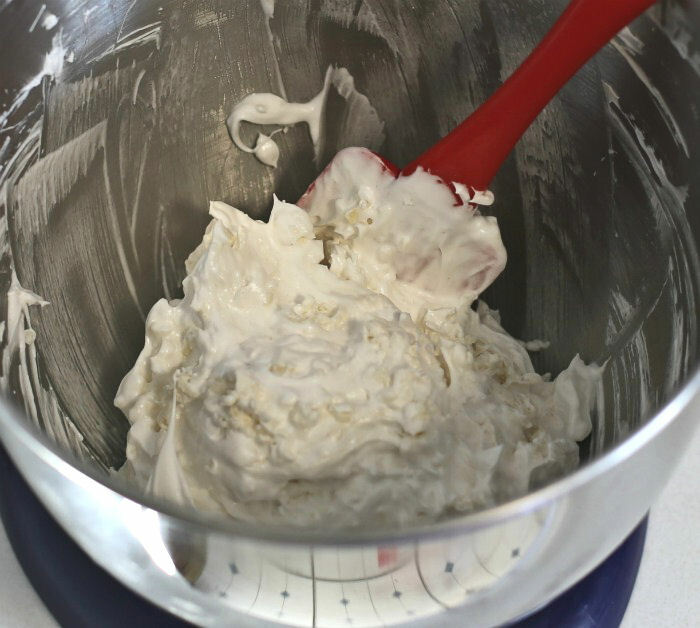 The egg whites also make the cookie very light in both texture and taste. I limited the flour. The whole recipe has only 2 tablespoons of flour! The sugar is limited to just 1/3 cup which means that each cookie has less than 1/2 tablespoon of added sugar. I used 15 Ghirardelli chocolate melting wafers (one for each cookie.) Many macaroons are dipped in chocolate. Drizzling allows you to give the taste without a lot of calories and fat. Adding fruit to any recipe gives extra flavor for very few calories. 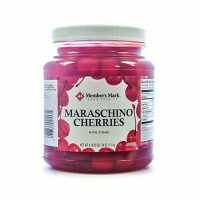 Each maraschino cherry has only 8 calories! Don’t let the substitutes make you think that the macaroon cookies will have a “diet cookie taste.” It is anything but. These cookies are the real deal in the taste department! This recipe makes 15 good sized chocolate coconut macaroons. Each cookie has 78 calories and is very low in saturated fat and sugar compared to a normal cookie. They are only 4 WW Freestyle points each, so you can easily fit them into your diet plan. Keep the container of coconut macaroons for up to one week at room temperature. There is no need to put it in the fridge. It is always nice to find a cookie recipe that holds up well in the freezer. This one does freeze well. For longer-term storage, or to make them ahead of time for the holidays, just wrap the individual chocolate cherry macaroons tightly in plastic wrap and place them in a freezer-safe, air-tight container. These delicious cookies will keep for at least three months in the freezer so you can make them well ahead of the time you need them. 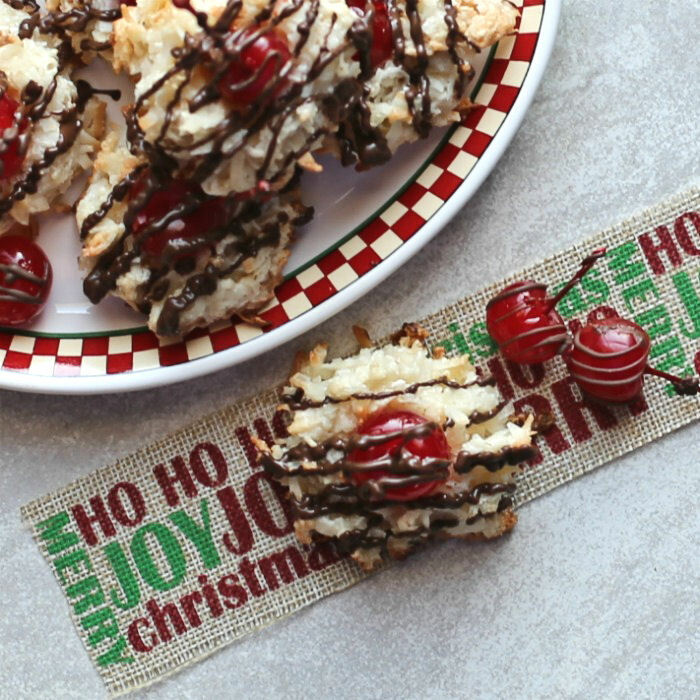 Would you like a reminder of this coconut macaroon cookie recipe? Just pin this image to one of your dessert boards so that you can easily find it later. 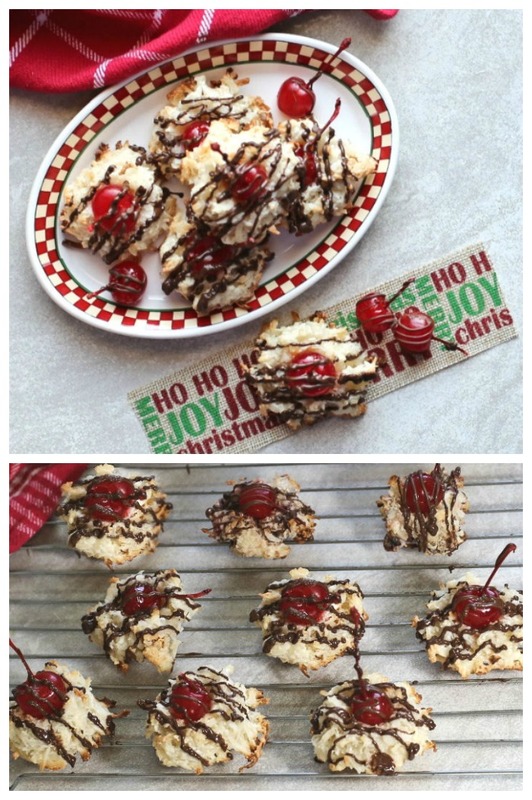 These chocolate cherry macaroon cookies will be appreciated as a take-along sweet treat to any holiday gathering. Bring them to your annual cookie exchange. Everyone will want to know how you managed to make them with just 78 calories. 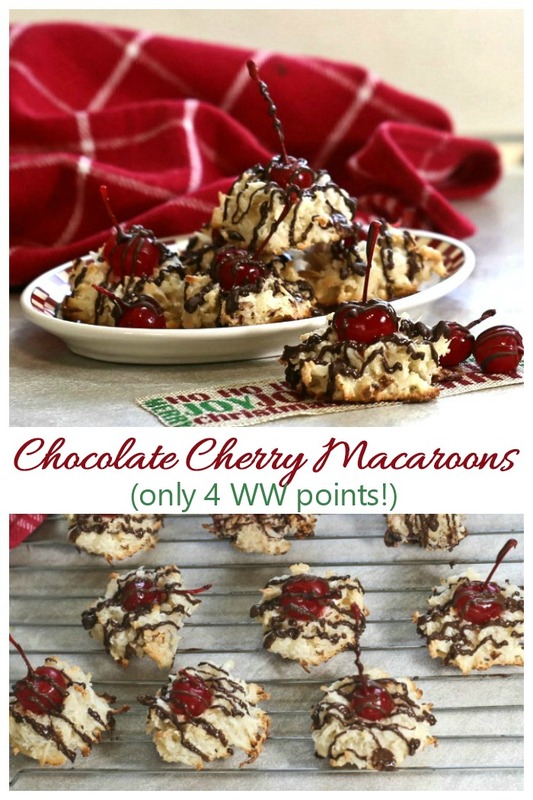 Chocolate Cherry Macaroons - Only 4 WW Points! 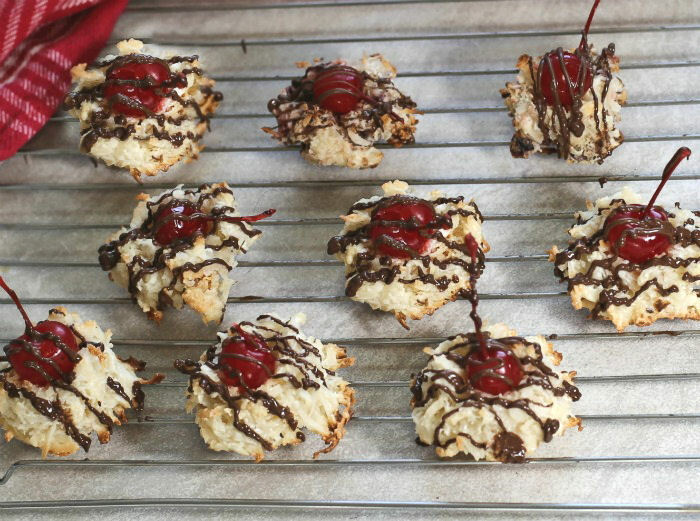 These chocolate cherry macaroons have a crunchy coconut based that is drizzled in dark chocolate. Only 4 WW Freestyle points per cookie. 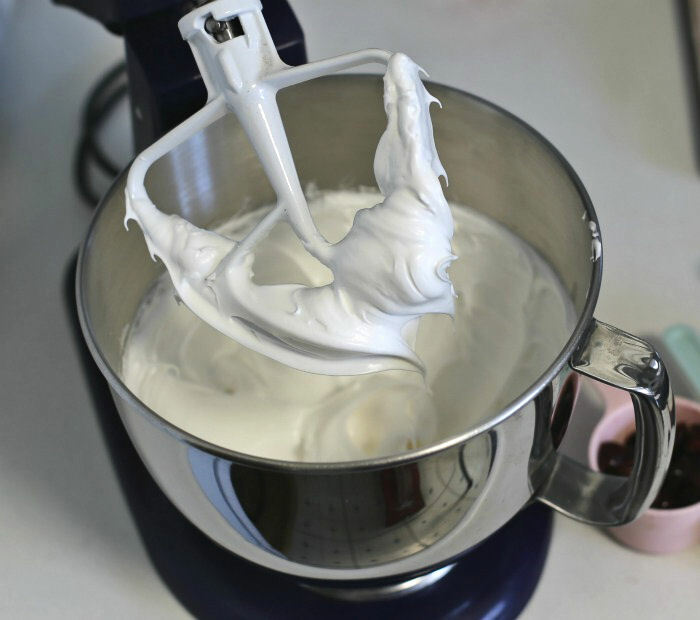 Combine the egg whites and sea salt in the bowl of a stand mixer. Beat at low speed until the egg whites are frothy, about 1 minute. Add the sugar, increasing the speed until the egg whites are stiff and have glossy peaks. This takes about 5-7 minutes. Gently fold in the flour, vanilla extract, and coconut flakes. Drop the batter by heaped tablespoons on the prepared baking sheet. Bake until light golden brown - about 14-15 minutes. While still warm, make a small indentation in the cookie and add a maraschino cherry to the top of each one. Melt the chocolate wafers in a microwave safe bowl in 20 second increments until smooth. Add to an icing bag and drizzle of the cookies. A dot of drizzled chocolate under the cherries will hold them in place better if you need to transport the cookies. These cookies have 4 WW Freestyle points.